Stimulating, soothing, and antibacterial .Steam distilled from the rhizome of the herb, Plai Essential Oil has long been regarded by Thai massage therapists as absolutely essential for treating joints and muscles, as well as reducing inflammation. 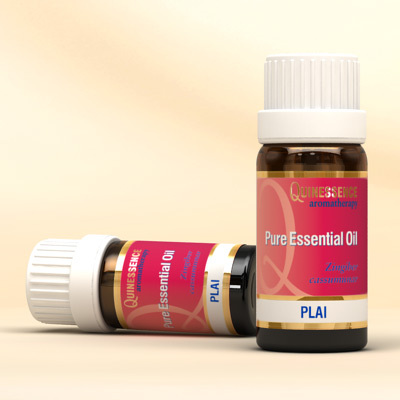 Plai Essential Oil is also a powerful antibacterial and antioxidant, making it useful in anti-wrinkle and anti-aging creams and lotions. Its noticeable analgesic and muscle relaxant properties make it perfect in massage blends to soothe those aching muscles joints after overdoing things in the garden or with sports activities. The healing properties of the plant have been legendary in Thailand and Southeast Asia for centuries, and Plai Essential Oil is still used across these regions in folk medicine for acne, bruises, coughs, colds, digestive disorders, nausea, and respiratory conditions. Plai is believed be native to India, but the quality and efficacy of the essential oil from this region and others in Southeast Asia is not as good as that from Thailand. Since the price of genuine Plai oil from Thailand is higher, it is not uncommon for oils from these other regions to claim their origin as Thailand. The Plai oils from other origins often resembles tea tree in aroma due to lower levels of many important constituents. Plai belongs to the same botanical family as ginger (Zingiberaceae), although it has different therapeutic properties and a more powerful action than this close relative. Also known botanically as Zingiber montanum, the essential oil from this plant has been subjected to intense research in Thailand. It was proven that the essential oil exhibited a powerful anti-inflammatory effect when appied topically, due to the activity of 5 major components. Testing showed that Terpinen-4-ol, a-Terpinene and (E)-1-(3, 4-dimethoxyphenyl) butadiene (DMPBD) significantly inhibited oedema formation. The most active compound was found to be DMPBD, which was twice as potent as the reference drug Voltarol (also known as Diclofenac) which is a nonsteroidal anti-inflammatory drug. Voltarol is currently one of the strongest known anti-inflammatory drugs available, but several adverse effects have been reported, therefore Thai essential oil is a safer, natural alternative. Sabinene, Terpinen-4-ol, (E)-1-(3,4-dimethoxyphenyl)butadiene(DMPBD), g-Terpinene, a-Terpinene.